I strive to portray a spirit and a energy flux in sculpture. I work with metal. transforming it from a static, heavy mass to an animated presence pulsing with energy, alive with movement. I sculpt recognizable forms designed in a contempory language. 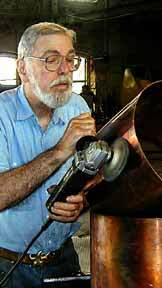 I usually prefer to work directly with metal developing shapes by heat and pressure, tension and compression. Tool marks and welds are revealed (as brush strokes in a painting) only when they add to the aesthetics of the sculpture, otherwise my tendency is to polish to a mirror like finish. This way of working preserves the metals intrinsic properties unlike casting which replicates a clay or wax preliminary model. BibliographySculpture of a City-Walker Publishing Co.